This is the fifth in our series about local companies that have achieved the City of Tampa’s Green Business Designation. 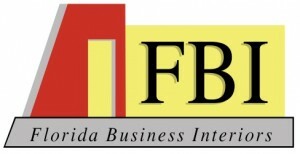 This week we highlight Florida Business Interiors (FBI), a full service interior design and office furniture dealership located in Centro Ybor. The company has been in business since 2006, and achieved their designation in 2010. Reduce water use by using aerators on faucets. Minimize energy use by using “insta-hot”units for hot water rather than water heaters. Minimize trash by using actual cups, plates and glasses instead of disposable ones. Recycle paper, ink and toner cartridges. Reduce greenhouse gas emissions by delivering materials directly to the customer site instead of receiving them in a warehouse, reloading, and redelivering to a customer. This allows trucks to spend less time on the street. Minimize paper use by using the “cloud” to operate as “paperlessly” as possible. When FBI moved into its current showroom in 2010, it chose to repurpose as much of its existing furniture as possible. According to Kevin Baker, FBI’s President, they were very successful, repurposing about 95% of existing product to create the new showroom. In addition, everything FBI offers has a component of sustainability built in, from percentage of recycled content to recyclability. For example, the vast majority of their seating is MBD Cradle to Cradle Certified, and Haworth, the manufacturer, offers a “take back” program that can be utilized at the end of their useful lives. Cost savings. The “direct to customer” delivery avoids double-handling of materials and requires less manpower, saving labor costs. The move to electronic processing of invoices and payments saves paper and postage costs, and lower water and energy use results in lower bills. Time savings. “Direct to customer” delivery also saves time for both FBI and its customers. Electronic handling of invoices and payments is far faster than paper processing and allows FBI to get paid sooner. The bottom line: higher profits, even in difficult economic times. A move to the “cloud.” Recently FBI put all of its business processes in the “cloud”. thus eliminating the need to replace antiquated servers with new models to support their growing business. This move will also allow employees to work from anywhere, anytime, rather than having to drive to the office to get their jobs done. From paper to electronic. FBI is also providing all invoices to customers electronically rather than by traditional mail in order to eliminate waste in postage, paper, etc. Many clients are now set up to pay via ACH (an electronic payment service) rather than hard-copy check, with all the related postage, paper and envelope costs.